Federal Reserve officials are spelling out that there are high hurdles to raising interest rates while inflation continues to undershoot their 2 percent target and risks to the economy abound. U.S. central bankers are making clear through their public statements that they are placing a significant emphasis on the price side of their dual mandate as inflation readings continue to lag despite solid U.S. economic growth and nearly full employment. Brainard’s comments was proceeded by remarks at separate events from Fed Vice Chairman Richard Clarida, New York Fed chief John Williams and St. Louis’s James Bullard that touched upon the tepid state of prices. Clarida reinforced the message further in a CNBC interview later in the day. “It is important for us to demonstrate that inflation can get back to 2 percent and stay there on a sustained basis,” he said, adding that the Fed doesn’t see the need for a rate move in either direction with the economy and monetary policy both in a good place. Fed officials in March forecast no rate increase this year and just one in 2020, according to their median estimate, amid risks from weaker growth abroad and signs of slower U.S. spending in the first quarter that has cooled the U.S. economy. That marked a pivot from their December forecast that signaled two hikes in 2019. Policy makers are also worried about external risks such as slowing European growth, the potential of a disruptive Brexit and the ongoing Trump trade war, according to minutes of their March meeting released Wednesday. Money-market traders are predicting at least some probability of a cut later this year, though Fed officials have not signaled they are preparing such a move. The Federal Open Market Committee “may miss its inflation target on the low side in 2019 based on current readings of market-based inflation expectations, following seven years of inflation mostly below target,’’ Bullard warned. The Fed’s preferred gauge of price pressures, the personal consumption expenditures price index, has averaged 1.5 percent since the U.S. expansion began June 2009, while the core measure, minus food and energy, has averaged 1.6 percent. 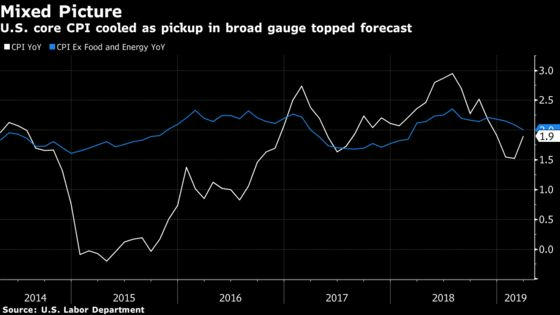 “We are going to be looking at the inflation data and the growth data, and we are going to be taking our lead from that,’’ Clarida said earlier at a conference in Washington. The Fed No. 2 said he is paying attention to so-called breakeven inflation rates, an indication of the rate of expected prices in the future derived from inflation-indexed bonds. One measure, which captures inflation starting five years from now, has been below 2 percent since October. “Some indicators of longer-term inflation expectations remain at the low end of a range that I consider consistent with our price-stability mandate,” Clarida said.